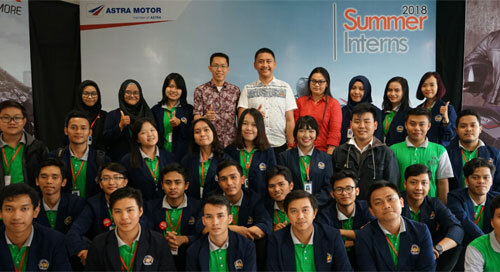 "Becoming Belonging to the Nation and Country", Astra Motor Pontianak this year again held the Summer Internship program for students who are running an Internship / KKM program at the University level. In the Astra Motor Summer Interns 2018 program, "We not only provide internships in general, but students are also given training and various materials every week"
"Students can feel the real world of work from Monday to Friday every week and on Saturdays, students also get materials and guidance on how to deal with the current competitive world of work, one of the materials provided is the material about communication and perception and people building. Besides that, building training and compactness games were also given to train teamwork skills from apprentices ", said Mr. Agust Tri as Head of Adm. & Fin. Astra Motor Sub-Dept. Pontianak. The apprentice participants from Tanjung Pura State University Pontianak in this program were divided into various teams to be able to see how the work process in various parts of the company such as Marketing, Finance, Customer Care to Spare Parts and Service at Astra Motor Pontianak. Participants are given challenges in the form of projects that must be solved together with their colleagues. For a month, these students complete the assignments given to them which will be presented back to each mentor to be assessed for their internship / KKM results so far. To be sure, participants are also provided, how to present a good presentation. "Having an internship opportunity at Astra International, especially Astra Motorbike is something extraordinary, being a happiness and more beautiful than filling a holiday, many things we go through that make us laugh and, many things we learned during this internship process, ... "
"Internship? Ah, I was told to photocopy, and between this, I felt there was no work to do. Nooooo !!!!!!!! This statement does not apply to participants of the Summer Interns Astra Motor 2018. Here I tell you the experience of internships at Astra Motor ... "
"I'm very lucky to get experience here"
"Thank you very much for Astra Motor has provided us with provisions in the real world of work ... This experience will be remembered forever. Greetings One Heart "
The program also received a good response from one of the internship lecturers, Mr. Handi Brata: "I see an apprenticeship program like this is very good to increase knowledge and student skills, so there are links and matches with the knowledge they get in college and the world of practice" .